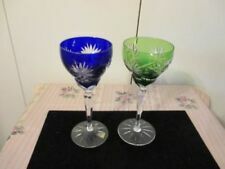 Offering a beautiful Rogaska Gallic pattern lead crystal water goblet hand made stands 9 1/4” tall. This pattern was discontinued in 1997 and is highly sought after today. This Goblet is in MINT UN-Used condition Guaranted. New Listing(3) Gorham crystal Trinity pattern wine glasses 8&3/8"
(3) Used wine glasses in the Trinity pattern by Gorham. Take a good look at the photos as set is being sold as is. Get Supersized Images & Free Image Hosting. I do not know if the lighter works.the push button seems to work correctly. 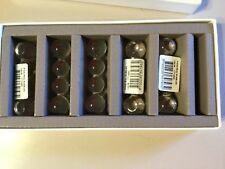 Miller Rogaska SOHo Hi Ball Hiball Glasses Set of 2 Crystal Glasses. Condition is New. I have never used this bowl, as I have identical ones that I do use, just don't need so many. Makes a very nice table setting. Can be used for nuts, or candy, or to serve a salad or ???. High Quality Clear Crystal Lotus Flower 3" with Gift Box. Check Our New Arrival Sparkle Crystal Lotus Flower. The vase is 7 3/4" tall and 4 3/4" and 4 1/4" wide at the top. 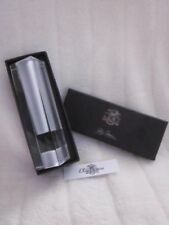 The vase features butterflies and flowers laser etched into leaded crystal in a beautiful pattern. Signed and dated. 12 Rogaska Gallia Tumblers. Beautiful set of Rogaska Gallia tumblers. Very beautiful set of Rogaska crystal tumblers. Exquisite etched patterns and cuts. 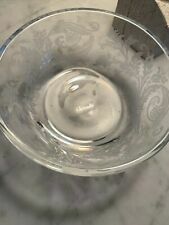 One tumbler has a tiny piece of carbon baked within glass at bottom of tumbler (would've happened when made.). Shannon Designs Crystal Biscuit Jar W/Lid. Condition is Used. Shipped with USPS Priority Mail. Very nice used condition. Does have two very small chips on edge of cover but they do not effect use are very hard to see. Brilliant hand blown and cut crystal by Shannon a Waterford company. Please see photos as they are part of the description. No returns. No guarantees smoke, pet or allergen free as I don’t know it’s history. Thanks for shopping! A cut glass jar with spoon. I'm not sure if the lid and spoon are silver. There is only one marking on the spoon which reads, H. S. M, EP. I'm thinking this cute little jar was maybe used for sugar. 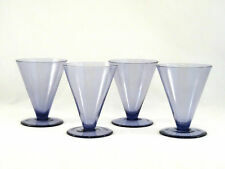 Set of 4 St Louis Crystal Cordial Glasses, each 4 7/8" tall. Elegant set! This piece is stunning. 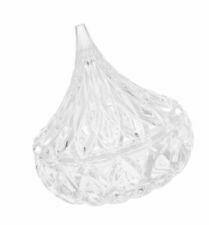 It is a lovely cut lead crystal cookie jar with lid. It has a wonderful hobnail and swirl pattern with cut diamond patterns along the sides. The lid fits snugly over the top of the jar itself. New ListingReidel ? Crystal Wine Glasses Set Of Four NICE!!! Old? Beautiful set of crystal wine glasses. Not sure of age or exact pattern. Has that wonderful fine crystal sound! One has a couple scratches as pictured but have to look close to notice. No chips or cracks. Happy bidding! New ListingLead Crystal Glass Vase Large Footed 10" Tall - Excellent! Pair of Candlestick Holders 10". Toscany St George 24% Fine Lead Crystal large Bowl NIB. Made in Germany Condition is New. Shipped with USPS Priority Mail. Danish Design Crystal Bud Vase Hand Crafted in Romania Glass Flowers . Condition is Used. Shipped with USPS Priority Mail. Hofbauer The Byrdes Collection deep basket. This basket really sparkles in the sunshine. I will reply. I do my best to represent them in a clear, concise and honest way within the limited confines of my knowledge. Lead Crystal Glasses Gallia by Rogaska. Pattern: Gallia, cut floral design. Manufacturer: Rogaska, Yugoslavia. This sale is for 3 glasses (1 each - Water goblet, wine, and hock). They have a really unique square stem. I have tried to capture the pattern as well as the beauty but i don't believe the pics do them justice. Unique opportunity. Ralph Lauren Cut Crystal Red/White Wine Stemware. New Listing VINTAGE 3 FOOTED CRYSTAL CUT GLASS CANDY NUT BOWL FLOWERS VASE . Vintage 3 Footed Lead CRYSTAL Cut Glass Candy Nut Bowl Flowers Vase .Excellent condition.Size is 3" Tall and 5.8" across. 8 Poltar 24% lead crystal plates from Slovakia. Shannon Crystal Serving Sugar Dish Pineapple Collection. Condition is New, NIB, Made in Slovakia Shipped with USPS Priority Mail. I have 5 mugs available. Quantity is limited. Pieces are sold individually. By Cristal D'Arques/D'Arques. Pattern: Masquerade. It's very pretty, and would especially make a nice gift. You'll want to buy this pretty cut crystal vase at this price. It's has an acid etch capital letter M mark on the bottom. Make gift buying and sending easy on yourself! FLORAL DESIGN. CARAFE AND A 9 OZ. (3) Gorham crystal Trinity pattern wine glasses 8&3/8"